Waupaca County, created in 1851 from Brown and Winnebago Counties, is named for the Menominee word "wau-pa-ka-ho-nak," which means "white sand bottom" or "brave young hero." 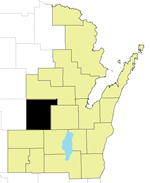 Located in central Wisconsin, the county seat is Waupaca. Transportation coordination involves human service agencies, transportation providers, consumer groups, and public officials working together to develop and improve services for individuals unable to provide their own transportation. Many of those served are not able to provide their own transportation as a result of disability, age or income. Transportation coordination provides more rides to more consumers through cooperation, communication and sharing resources, ensuring that transportation resources funded by local, state and federal programs are well-managed.